Considering Stockholm is a city built on many small islands, it’s not surprising that a favorite mode of transport is the ferry. In the city, there are several ferries used both by commuters and by pleasure trippers. The Djurgårds ferry takes people from Slussen on Södermalm to the museum and activity island of Djurgården. It’s a cute little boat that looks like a toy that a giant has flicked with his finger and thumb as it catapults over the waterway to the other side. This ferry also carries visitors to Östermalm and to Skeppsholmen, an Island located in the middle of the harbour, and is very well patronized by the city’s inhabitants. Three other ferries in Stockholm are the ones taking well-heeled dwellers from the docklands development of Hammarby Sjöstad to Södermalm, and from Hammarby Sjöstad into the city, and the ferry that shuttles passengers from the Old Town to the suburb of Nacka and the islands of Fjäderholmarna. But perhaps the most noticeable ferries are the giant liners positioned in Stockholm’s harbour that take passengers and vehicles to the Baltic Island of Åland and to Finland. These ferries satisfy various needs for Stockholmers. Some use them as a mode of transportation between Sweden’s capital and the Finnish cities of Helsinki and Åbo, maybe to work or to deliver goods or visit family. Others use the ferries as pleasure cruises, an opportunity for a trip out to sea, to eat well and maybe watch a show. Others use them as a way of buying cheaper duty free alcohol as the ferry bobs around in international waters. And other Swedes use them in a way that has gained these ferries notoriety – as a booze cruise. 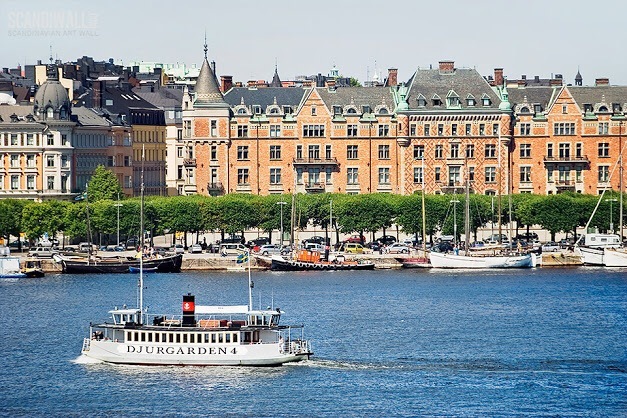 A popular weekend pastime is to embark the ferry on a Friday, drink, dance and party, and disembark, somewhat frazzled, when it returns to Stockholm 48 hours later. Whatever the reason for taking one of Stockholm’s many ferries, this mode of transport is an undeniable part of the waterscape of this city and it certainly does contribute to Stockholm’s description as ‘the Venice of the North’.